Kavitha was a stay at home mother of three when she decided to rejoin the workforce. Although she’d had a prior career as a finance analyst, Kavitha decided it was time to embark on a career that aligned with her fascination with programming. 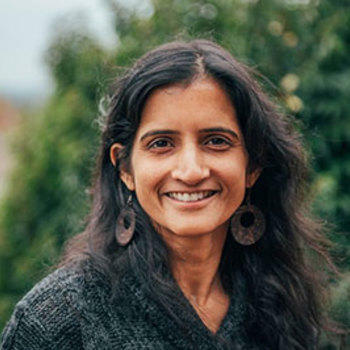 Inspired to create something tangible that her children could engage with, Kavitha joined Treehouse and began learning Swift. In less than four months, Kavitha learned Swift, designed, created and successfully deployed an educational app for children, Math Blast Off to the App Store. Today, Kavitha is working on her second educational app and embracing the experience of following her passion for coding and bringing her apps ideas to life. Treehouse offers a wide variety of courses that will provide the perfect platform to launch your ideas… Start with Treehouse and let your ambitions guide you. I was a stay at home mother of three boys prior to joining Treehouse in November 2014. My background is finance. I worked as a finance analyst for Intel till 2003 prior to having children. I have always been fascinated with programming. Even as a finance analyst I would dabble in writing short programs with a simple user interface in Access to automate financial reporting processes for my team. You chose to focus on learning to build apps. Tell us a little about why you chose this Track and what you've accomplished since learning with Treehouse. I chose to build apps because I wanted to create something tangible that my children can use and even help me design. My children love playing games on my iPhone so I thought that would be a perfect place to start. I started with the “Swift Basics” course and then proceeded on to the “Build a Simple iPhone App with Swift” course. These two courses were enough to inspire me to design an educational app for children. In less than 4 months, I learned Swift, designed, created and successfully deployed my app that features multiple view controllers, sound effects, and changing graphics to the app store. I was even able to involve my children by having them help with the design. They chose colors, sound effects and even got to be my official quality testers. They are very excited to see the app and their design choices in the app store. Is there any advice you’d like to share with new Treehouse students, who are just getting started? If you are interested in learning iOS programming, look no further than Treehouse's Swift course. Treehouse offers a wide variety of courses that will provide the perfect platform to launch your ideas. By taking courses from Treehouse, you will get plenty of examples and exercises that will allow you to learn hands-on. Build on these exercises by extending them and use other sites like Google and Stack Overflow as a supplement. This will help you get a firm grip of the core concepts presented in the course and of the programming language in general. Start with Treehouse and let your ambitions guide you.